THE BLEACHER BRIEFINGS: Is Winning in the SEC Important Enough to Sell Your Soul to the Devil? Is Winning in the SEC Important Enough to Sell Your Soul to the Devil? As the SEC football season winds down, it's time for the coaching carousel rumors to start flying, especially with Joker Phillips already becoming the first casualty. This year, however, there is a wildcard. There is a coach who's proven he can win in this league. He's available, and he would jump at just about any offer that came along. Universities just have to decide if they are willing to sell their soul to the Devil, and accept all the baggage that comes with the pitchfork and pointy tail. That coach is one Bobby Petrino, who was fired at Arkansas when he got caught with his *ahem* "hand" in the athletic department "cookie jar" (he was having an affair with a 25-year-old department employee that he hired, then lied about it after she was riding shotgun on his motorcycle when he crashed). So far, Petrino's name has been mentioned as a replacement for Phillips at Kentucky (by Petrino's own father, no less), to replace Derek Dooley in Tennessee, as Gene Chizik's successor at Auburn, and, believe it or not -- even returning to Arkansas in place of John L. Smith! You can rest assured, with his experience and level of success in the SEC (amassing a 34-17 record at Arkansas, including going 21-5 the past two years), someone will take a chance on him. And I believe, live to regret it. Granted, Petrino is a much better fit at some places more than others on the list. He has a history in the state of Kentucky, going 41-9 in his first head coaching job at Louisville from 2003 to 2006. Kentucky has struggled in football for years, and this would almost instantly make them relevant. Oh yeah, and don't forget, they hired John Calipari in basketball, so obviously, a coach's personality isn't weighed in their hiring process. I would list them as probably the best fit within the conference, even though UK Director of Athletic Mitch Barnhart says it's not happening. Tennessee's fan base has claimed all along that they have their sights set on John Gruden. Well good luck with that one. Gruden currently has a stress-free job, works one lousy day per week, and makes 7 figures. So yeah, he isn't going anywhere. And would Petrino's act even work in the mountains of East Tennessee? Only if he gives up the motorcycle. That brings us to Auburn. Petrino is already familiar with life on the Plains. He was the offensive coordinator there back in 2002. He alienated that fan base once, with the now infamous "Jet-Gate." Rich Auburn boosters and the (since departed) AD flew to Louisville to interview Petrino, even though then-head coach Tommy Tuberville (who hired Petrino as the OC a year earlier) was still employed. Many pegged Petrino as a snake then. The other problem is that Auburn is very proud of the "Auburn Family" mystique they have built. They sell that philosophy within the base. They market items with "Auburn Family" emblazoned on them. Do they really want the man leading the "Family" to be one who has extramarital affairs with women half his age? Is this the Soprano Family? It would cause such a rift within the fan base, I don't know that it would recover. Then, of course, there is his latest job, back at Arkansas. 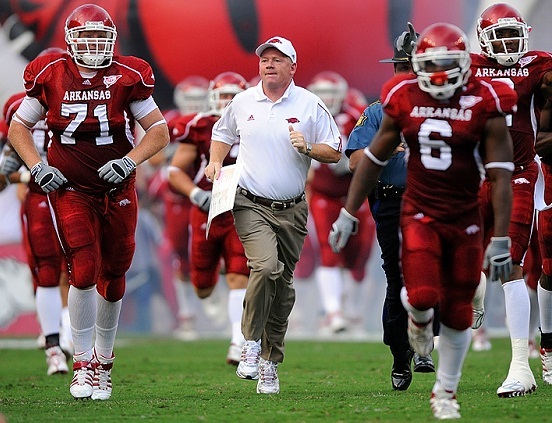 Does anyone (other than Jimmy Johnson) really think Arkansas could possibly rehire him? Forget the affair (if you can). He lied to AD Jeff Long, who took that info to the media, which made it look like Long was covering the whole thing up. There is no way the Hogs take him back. If you add the affair, all the lying, all the backstabbing, and the way he left his head coaching job with the Atlanta Falcons mid-season without even so much as an explanation to his players, I'm not sure why anyone would want this guy. Oh wait, I forgot. This is the SEC, where winning in football is more important than everything else. Hopefully this clown has used up all his chances. But like you said, I wouldn't be surprised if someone gives brings him in. The guy is a total scumbag. Hope he's used up all his chances. Like Petrino is the only coach to have had an affair? Or quit another job? He's still a good coach and plenty of teams would be lucky to have him. No questioning his coaching ability. Nor your assessment that other coaches have done similar things. But as a fan, I don't advocate hiring guys like this. And as a parent, I can assure you, I wouldn't allow my kid to play for him. Especially if one's kid is a cute, 19-year-old punter or placekicker, which will eventually happen if it hasn't already. Unlike now, there would probably be much more of a discussion about morals and ethics taking place in the living room between a college recruiter and family if the potential recruit is someone's daughter who can consistently nail field goals from 40 yards out. Are there any former head coaches whose careers truly came to an end as long as they were seen as someone who could turn a program around, or do they just keeping digressing back to lower divisions before eventually fading away? Unfortunately, no. If a coach is seen as viable, someone will give them a chance. Again, morals don't seem to go into the hiring decisions very much any more.